Come quietly, or there will be beans. Well, there will be beans either way. Today, is Setsubun (節分) in Japan. It's a bean-throwing festival to cleanse evil and bring in good luck. People in Japan either attend Shinto shrines or Buddhist temples to throw beans, or at home, they throw beans at a family member wearing an oni (鬼) or "demon" mask. 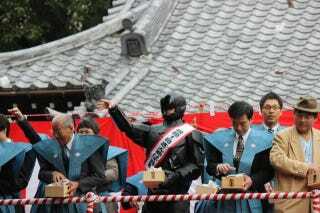 As part of the promotion, RoboCop appeared at a Setsubun festival at Shibamata Taishakuten, a Buddhist temple in Tokyo. At the event, RoboCop threw "fortune beans" or "fuku mame" (副豆) and thanked everyone for their cooperation. Below, you can see photos of the event from Japanese site Cinema Cafe. No, the police officer character is not the demon. RoboCop is slated to open in the U.S. on February 12 and in Japan this March.